Nutty and crunchy, flaxseeds add more to your diet than just flavor and texture. A nutritional powerhouse, these tiny seeds are rich in fiber, essential omega-3 fatty acids and lignans. They're good for the heart and help lower risk of certain types of cancer in men and women. But flaxseeds are especially advantageous for men, because they help prevent health issues more common in males. High cholesterol increases risk of heart disease, and men tend to have higher numbers than women, according to the Centers for Disease Control and Prevention. The lignans, which are phytoestrogens, in flaxseeds may help lower total cholesterol and LDL cholesterol, according to a review study published in the "Journal of Cardiovascular Pharmacology." Lignans primarily occur in ground flaxseed, also known as flaxseed meal, which men can mix into a smoothie or sprinkle on their morning cereal for a nutritional boost. Chronic low-grade inflammation increases your risk of atherosclerosis, which may lead to heart attack or stroke, and is another heart disease risk factor. The death rate from heart disease in men is 1.5 times greater than in women, according to the Palo Alto Medical Foundation. Including flaxseeds in your diet to reduce inflammation may help lower your risk of heart disease. Flaxseed is rich in alpha linolenic acid, an omega-3 fatty acid. The ALA in flaxseeds helps decrease inflammation by reducing pro-inflammatory proteins. Flaxseeds offer two benefits for your colon. One, the fiber and mucilage in whole flaxseeds acts as a laxative and can help men dealing with constipation. Two, flaxseeds may help lower risk of colon cancer, which is 1.5 times more likely to lead to death in men than women, according to PAMF. 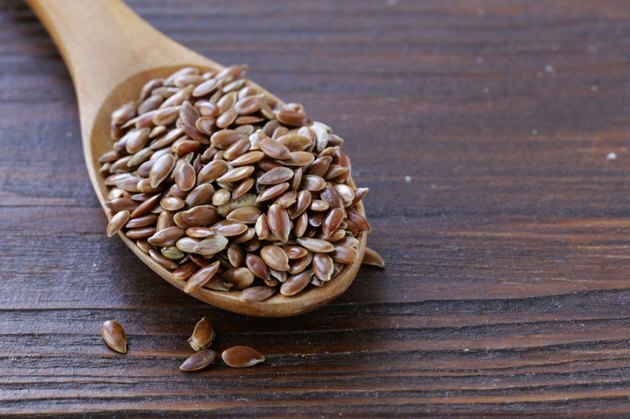 Animal studies show that whole flaxseeds influence the overexpression of genes that lead to the death of colon cancer cells, while flaxseed meal may help decrease growth of cancerous lesions. But human trials are necessary before formal recommendations regarding flaxseed and colon cancer are possible. Men with prostate cancer should eat a healthy diet that includes sources of beneficial fats, such as those in flaxseeds, to improve health and prevent cancer progression. Concern exists, however, that more intake of ALA may increase risk of prostate cancer, according to the University of Maryland Medical Center. But this reflects only a few studies, says the University of Maryland Medical Center, and evidence suggests flaxseed is beneficial for men with a risk of prostate cancer. If you have a history of prostate cancer, you should talk to your doctor first before adding flaxseed to your diet. Acta Cir Bras: Use of Defatted Flaxseed Meal Reduces Precancerous Colon Lesions in C57BL/6 Mice. Current Opinion in Urology: What Should We Tell Prostate Cancer Patients about (Secondary) Prevention?